More photo’s and a nice review quote. I have more pictures from RWA-not mine, of course, although I did take my camera I forgot to take many pictures. I’m truly lousy at taking photos so you didn’t miss anything except the back of Nora Robert’s head and a few elbows! Oops I just kicked my dog right in the nose with my big toe, he’s looking at me funny now-okay, now he’s licking my toes-would I be sick if I said I kind of liked it? Here’s a great picture of Ms Lilian Feisty, an RWAOnliner and EC author, and yes, she is just as naughty as she looks. Beware Feisty, she is Trouble-in the nicest possible way of course! And before you ask, yes that is me in the red cowboy hat and flashing feather boa. It was the obligatory RWAOnline party wear along with red shoes, honest. Another special person-Ms Louisa Edwards, stalker extraordinaire and book reader/critter who is very keen to get her hands on Peter’s story from the second Kensington book, no idea why 🙂 Louisa has just won a print copy of “Planet Mail” which is why she is looking so happy! The fabulous Maria Geraci, another person who gets bombarded by crit requests from yours truly and always comes through. She is looking through a deck of EC playing cards that I gave out at the RWAOnline party and seems to like what she sees. Okay Blogger is throwing a hissy fit at me so I’ll upload more photo’s later. 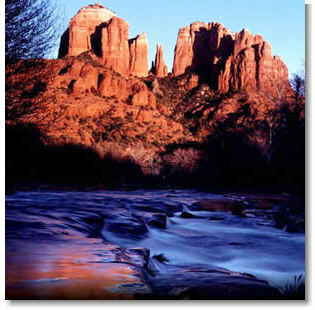 I’ve been away in Sedona, Arizona. It truly is one of the most beautiful places I have ever been to in my life. Enjoy the view while I disappear for a week to the RWA conference in Dallas, Texas. don’t forget to come by and say hi at the literacy signing on Wednesday July 11th, it’s open to everyone! First off, here’s the new cover for the print version of my Ellora’s Cave book “PLEASURABLE BARGAINS” which is a combination of ‘Eden’s Pleasure’ and ‘Antonia’s Bargain’. I was delighted to see that the talented art department at Ellora’s Cave excelled themselves yet again. I must admit that when I saw the first version of the cover, I did ask them if they could blur the little rolls of fat around her waist…it was a little too realistic for me! But they did a fabulous job and I shall happily pretend it is me if anyone inquires. My print copies of PLANET MAIL arrived this week as well. Of course I took the opportunity, (when Mr Kate wasn’t looking), to give the cover a good lick. How could I resist? As soon as I get organized, I’ll be running a contest to win a print copy of either PM or PB on my website. The books will be on Amazon and in good bookshops near you soon! I was in San Francisco this week and I happened to go past the Borders near Union Square. I decided to pop in and see if they had any copies of Cowboys-and they did. After a five minute pep talk, I persuaded myself to ask the store manager if I could sign the copies for her and she said yes please! I felt like Nora Roberts. It did occur to me that I could’ve pretended I was Nora Roberts because no one really asked me to prove I was Kate Pearce either. Emboldened by my success in San Francisco, I went into my local Borders and signed my copies there too! It was a fabulous feeling. Book stuff tends to happen in clumps rather than smooth lines and last week was a definite clump. I had to finish ‘Roping the Wind’ for Virgin ‘Cheek’ and my copy edits for ‘Simply Sexual’ arrived on the Tuesday. Despite having written a few books, it’s the first time I’ve actually had paper edits. It’s a surprise to see the pristine manuscript you lovingly placed in the mail come back covered in red pencil, post it notes and other stuff, which indicates that you might have to change things again! I still have weird transatlantic grammar issues which necessitate taking off letters and adding comma’s by the bucket load. Now all I have to do is get this baby back in the mail (overnight rather than regular) because if it gets lost, we have a big problem because it’s the only marked up copy in existence. This week I’m trying to keep writing another short book for Ellora’s Cave but I’m kind of distracted by the fact that I’m going to the RWA conference in Dallas on July 11th. I’m so not prepared since my writing marathon of last week. I need to get out in the sun, get my hair cut, have a manicure, etc etc. I asked Mr Kate if he could suggest a miracle diet that might make me lose 40 llbs by July 10th. He offered to cut my leg off. I have to look glamorous because I’m signing my books at the huge RWA literacy signing at the conference on July 11th-me, Nora and about 400 others. All the profits go to literacy charities both in the U.S. and the rest of the world. It;s open to the public so come and see me and I’ll sign your book!